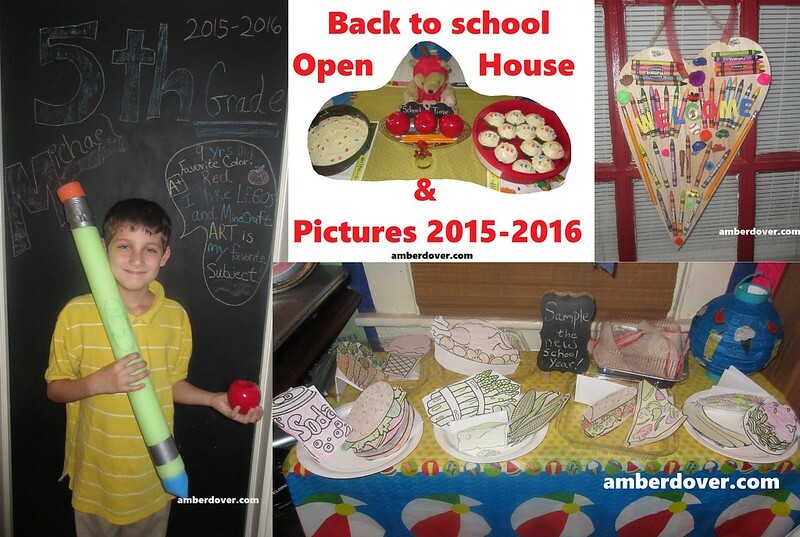 In this post: Back to school pictures, our 5th-grade open house from last year, and a school themed welcome sign. Hello, dear ones! Last year we had our first “open house” for homeschool. I wanted my parents and hubby to sample what Michael would learn in fifth grade. I took a short hiatus from my blog and this never got published. I have plenty of 5th-grade posts to catch up on, and this will be the first. It’s hard to believe that Michael is ten now, and Leeland is 16 months old! I hope to share our 6th-grade open house soon, but for now…let’s catch up ;). Open House Welcome sign ~ I made this school themed sign by gluing odds and ends on a wooden heart. It has pencils, crayons, cute buttons, marbles, and pom poms. Then I used letter stickers to spell “Welcome”. Sample the new school year ~ Michael helped me color food pictures, and then I stapled samples of his fifth-grade work on the back of each item. I wanted our family to get a taste of the different subjects. I set up a cute sample table in the homeschool room. You can see in the pic below that the pizza slice had a spelling list stapled to it. Open House Treats~ Of course, I served real food at the party. I used fake apples, pencils, and crayons as a centerpiece…along with an apple bear. I also put out our school mats. The bell was a nice touch as well. I actually do use the bell on occasions. We had an assortment of fruit and meats. Homeschool Room ~This was the last year we used our homeschool room. We now have a school house that I can’t wait to show you. The school room belongs to Leeland. For now, let us enjoy and remember the old school room :'(. We’ve had so many amazing memories in it! We started with an ocean theme, and we already had ocean crafts from Summer. During 5th grade, I tried a couple of new ideas: math gum, an effort meter, and brain breaks. These methods worked for a bit but fizzled out near the end of the year. Homeschool Curriculum~ Bob Jones English, Bob Jones Bible, Christian Liberty Press Spelling, Horizons Math, Lifepac History, A Beka Science, and A Beka Art B. I taught Michael to play the recorder and we continued to learn new piano music and practice scales. Extra arts and crafts were inspired by Pinterest. I used lapbooks as well, and I chose books for Michael to read every month. I tried to have the books correlate with our history and science themes. For example, Michael read Anne of Green Gables while learning about Canada and steam engines. Also, we read The Little Princess while studying London. Michael kept a journal too. Back to School Pictures~ Our new chalkboard door really came in handy for school pictures. I wrote out Michael’s favorites on the board. We used books, fake apples, and a pool noodle pencil for props. I normally don’t include myself in school pictures, but I figure other schools photograph their teachers. Why not us? Leeland~ 5 months old~ Leeland was so tiny then. Now he’s walking and into everything. He was too cool for school back then, but now he’s the class clown. I’m looking forward to sharing Tot School this year. Leeland could barely sit up then. I put a sheet over his bumbo seat and put him in it. Now Little man is a professional at modeling for pictures, but he wasn’t quite ready for the job at five months! Nana and Grandad hanging with Michael. Leeland giving Nana a kiss. I hope you’ve enjoyed our 5th-grade open house. Once I catch up on 5th-grade posts I plan on sharing our 6th-grade open house. I also want to share our new school house and our elementary graduation party. Lord willing, they will all be coming soon! PS: You can keep up with our homeschool fun by going to the Unit Studies menu and choosing themes. I’ve been blogging about homeschool for five years and we’ve built up a good collection of ideas. Check it out!